WEST LAFAYETTE, Ind. 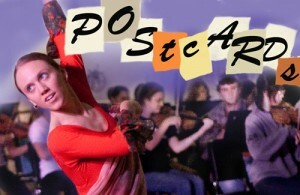 — Overwhelming response to a trial collaboration between the Purdue Philharmonic and Lafayette Ballet in 2011 has resulted in two nights of “Postcards” concerts in the Lafayette Ballet Ballroom on Saturday (Sept. 22) and Sunday (Sept. 23). Admission is free to the one-hour concert, but due to limited seating, reservations are advised. Call 765-423-1633. Four short, well-known classical works will be brought to life with a touch of humor through the dynamic collaboration of young musicians and dancers. The Purdue Philharmonic is conducted by Andrew King; the Lafayette Ballet is headed by Sandra Peticolas. The Saturday concert is at 8:00pm; the concert Sunday is at 4:00pm. The ballroom is located on the third floor of an historic downtown Lafayette building. The structure does not have an elevator. The Lafayette Ballet Ballroom is at 226 N. Sixth St., Lafayette, Indiana.